Sweet Spontaneity: Pre-Wedding Events - To Gift, or Not to Gift? I'm continuing on from my recent post about Bachelorette Party Gift Ideas and bringing you an overview of gift-giving for pre-wedding events. I hope to hear about your experiences in the comments! There are many pre-wedding events these days; I have heard of engagement parties, wedding socials, combined stag and does, separate stags and stagettes (or bachelorette parties), wedding showers, and a quick Google search turned up even more festivities. How does one decide which events to bring a gift to? And what is an appropriate gift for each event? The short answer is, it's completely up to you! The bride and groom are honoured by your support and attendance, and expect nothing more. That being said, if you desire to give the couple a gift (or multiple gifts for different events), what is appropriate? Each geographic area and social group has a slightly different set of guidelines when it comes to gift-giving at these pre-wedding events. If you are truly at a loss, you could ask someone in your social circle what they think, or you could do a Google search including your particular area. I am from the province of Saskatchewan in Canada, and I have found some generalities that usually ring true, but there are still some slight differences that I will try to note. To be honest, I had never heard of these until some of my friends and family from Manitoba and Ontario were getting engaged and married. This just isn't really a Saskatchewan thing. However, from what I've been able to gather, these events serve as a fundraiser for the wedding where both the bride and groom attend with their friends and family. Guests purchase tickets to attend and there are fun activities at the event such as casino games, carnival games, 50/50 draws, a cash bar, and more. These activities vary based on the provincial licensing board (which may explain why Saskatchewan doesn't really have these events). This event often (but not always!) takes the place of both the engagement party and the next event I'm going to talk about, the bridal shower. The bridal shower was once a pretty big deal around here, but in more modern times it is sometimes skipped in the pre-wedding festivities. Traditionally, this event was hosted by the bridesmaids and/or the mothers of the bride and groom for the bride, and a very wide and general invitation was sent out to women of the community (the older ladies from church and the little girls once babysat by the bride included), whether invited to the wedding or not. The gifts for this event were typically purchased off of the registry, or were simple/small things that are often overlooked but quite necessary to help a home function (lots of tea towels and wooden spoons!). These days, houses are often well-equipped by the time a wedding happens, so gifts of this nature are not as necessary and sometimes the event does not happen altogether. I have still attended quite a few bridal showers, but they have usually been for brides that have not lived with their fiancé before marriage. Even if the couple has not created and filled a home together, they often have their own household items to combine, so the gift giving has still changed. 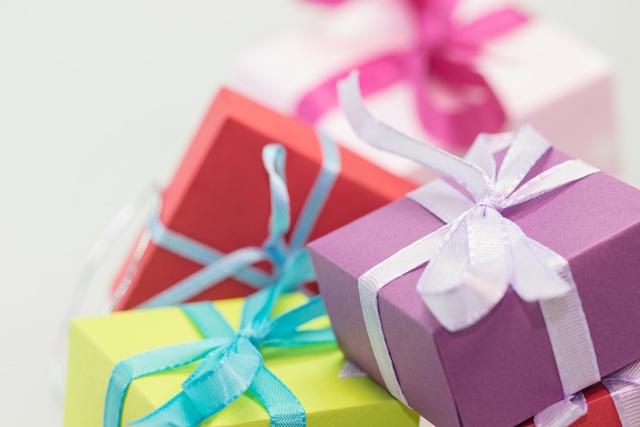 Gifts directed more towards the bride are extremely common, like aprons, beauty products, spa gift certificates, date night packages, hobby sets, etc. Sometimes the person organizing the bridal shower will give ideas for gifts, if you wish to bring one, or else it is appropriate to ask them if nothing is shared directly. These are the parties for the groom and the bride where the other is typically not invited. Seen as a "last wild night" for the soon to be married, these parties come in all shapes and sizes. Gifts are rare for the male parties, but the stagette (or bachelorette party) sometimes has a gift-giving component. If there are gifts at the bachelorette party, it is typically lingerie for the bride, or something in that vein. If this is something the group does, there is usually mention of it by the bridal party or the person organizing the event. They will typically share the brides sizes and mention what her tastes are. This party is usually for the younger women, and those closer to the bride - but sometimes the mother of the bride, the mother of the groom, and other important, mature women are included (which might affect what type of gifts are received lol). Check out my post on Bachelorette Party Gift Ideas to help you decide on a gift! That's my experience with pre-wedding festivities and gift-giving! How about you, what are your experiences? Are there any pre-wedding events that are typical for your area that I didn't mention? Topics such as this fascinate me, so I would love to hear what your areas and groups of friends do!